Paul W. Blake has over thirty years of experience providing quality criminal defense for clients from all walks of life in San Diego and the southern California region. He represents clients in federal, state, and appellate courts in matters ranging from DUI, robbery, and assault to narcotics, RICO, and homicide. Paul W. Blake is a member of the Los Angeles County Bar, the San Diego County Bar, and the National Association of Criminal Defense Lawyers. He is admitted to practice in both the Central and Southern Federal District Courts and the Ninth Circuit Court of Appeals. The justice system is a complex and confusing process, especially for a first-time offender. The government is a powerful entity to go up against. Representation is necessary and immediately required in order to protect your rights. 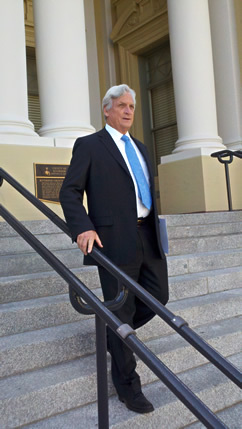 Paul W. Blake offers years of experience as an advocate for the rights of the accused. Paul W. Blake also has significant experience in civil litigation which includes matters of contract, construction defect, and family law. Legal services are also offered in the areas of immigration, bankruptcy, and real estate including assisting buyers and sellers of real property. His expertise and knowledge will navigate clients through a difficult and sometimes overwhelming process. Paul W. Blake provides skilled representation for all criminal matters in the following locations: Los Angeles, San Diego, Orange County, Riverside and San Bernardino. When you become my client, you will find a dedicated advocate for your legal rights who is completely committed to your case from beginning to end. As an experienced trial attorney, I can access and assemble facts and evidence in order to challenge accusations. It is essential that defendants in federal cases retain an attorney skilled and knowledgeable in federal law, federal sentencing guidelines, and the rules of the federal court in order to present an effective defense. State cases can often be affected by questionable police work, coercive interrogation methods, sloppy forensic work by underfunded crime laboratories, and overly zealous prosecutors. Financial elder abuse accusations and prosecutions are on the rise and legal representation is necessary to protect you from your accusers and the police. Both the state and federal governments devote an inordinate amount of taxpayer resources to the “War on Drugs.” There remains a great deal of disparity in enforcement of drug laws and many traps for the unwary.